From Futzorb To Mystery Rooms: Here's A List Of Things That Cropped Up In Chennai In 2018! Besides Marina beach, religious spots (Thousand Lights, Kapaleeshwar Temple, Santhome Basilica), libraries, malls, and parks, there is a list of new places that have cropped up in the year 2018. We look at some of the coolest spots that you must visit before the year comes to an end. Adding to the list of malls in Chennai is VR Mall located in Anna Nagar. Housing some of the top brands like Sachin Tendulkar's True Blue, Aldo, Charles & Keith, Esprit, Forever New, Guess, and H&M. You also have a fantastic food court with restaurants like Bombay Brasserie, Wrapchic, Taco Bell, and Utsav. Chennai is known for its parks in different areas. But this is the first time, Chennai has got an inclusive infinity park in Santhome. This is the city's first sensory park and garden that is open for children. Yeey, 2018, you were good! The park has a herb garden, around which is a modified swing, merry go round, and climbers and is a safe space for kids with all abilities to play and have fun. There’s also a basketball court constructed at a slightly lower level so children in wheelchairs can play. The iconic Taj Connemara that was closed for over a year has finally opened its doors to its loyal customers. Dating back to 1854, the hotel’s legendary history has been brought to life with fresh and modern sensibilities. The hotel's refreshed design has eclectic architectural influences of Classic Colonial, Art Deco and distinctive elements from the celebrated architect, Geoffrey Bawa’s ‘Tropical Modernism’. Coming to the food, expect informal and formal dining choices that will convey a 19th-century club-like feel. A little fun fact - did you know that The Lady Connemara Bar & Lounge was the city’s first licensed bar? Cool, eh? Make 2019 exciting by heading to Mystery Rooms in Nungambakkam. This is a game room where you and your squad play protagonists and are set in a perilous scenario. You solve the puzzles with plenty of clues and cross each scenario/room, within a stipulated time of 60 minutes. The Chennai Mystery Room has four themed rooms. Make 2019 happening! The Chinese brand, Miniso has finally opened two new stores in Chennai. One in Forum Vijaya Mall and the other at Phoenix MarketCity. Stationery products, bags, office supplies, kitchenware, lifestyle products, they have a lot that you can shop from. HomeTown, a chain of stores by Future Group has opened its first store in T-Nagar. Hassle-free furniture essentials, modular kitchens, home furnishings, household essentials, there is a lot at this store, that spans across three floors. If Ikea is out of reach, this is your answer for 2019! 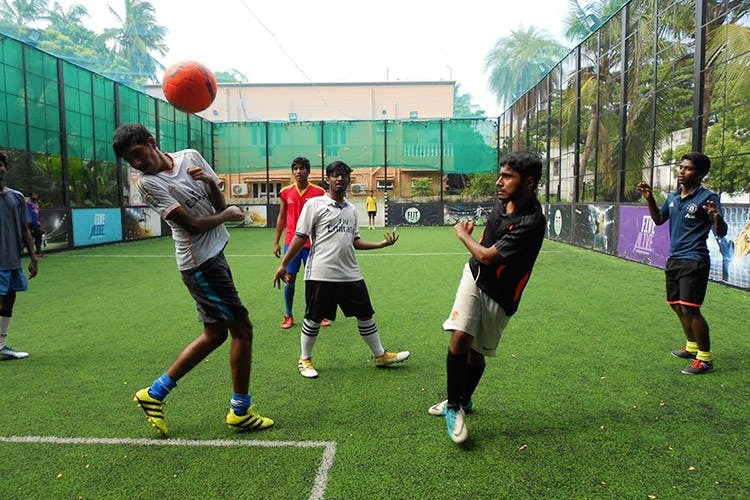 This is Chennai's first futzorb arena that lets you and your squad play the game in the most unconventional way. You can also indulge in a game of futsal and football. This year, a new metro line began operations. The line begins from Chennai Central to St. Thomas Mount on the Green line and AG-DMS to Chennai International Airport on Blue line are commercially operational. Commuting for namma Chennai peeps became that much more easier! SPI Cinemas and Magzter, the world's largest and fastest growing digital newsstand, present the 'Smart Reading Zone', now active in all SPI theatres and restaurants. Customers can browse through over 5000+ magazines on their own devices, at no extra cost. 2018 is all about happy reading! This has been a remarkable year for CSK and Dhoni fans. Only because Dhoni's brand, Seven launched in the city. In fact, it is the largest store of seven in the country. The store houses an array of products under different categories like cricket, running, training, outdoor and lifestyle sport. They have a variety of footwear, apparel, and accessories for both men and women. A multi-age experiential centre, Not A Box lets you engage in different activities that stimulate your mind and body. From climbing big blocks, crossing ropes, crawling through tunnels, there's a lot your kids can do at this place.